Have a Stubborn Bald Spot in Your Lawn? We Can Help! 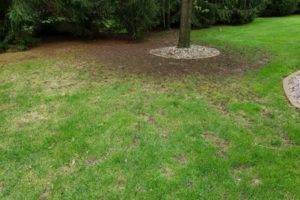 Waggoner Home Services Bald Spot Repair is designed to encourage grass to grow in difficult areas within a lawn where traditional overseeding does not take. When repairing bald spots we start with tilling in a fresh batch of soil and organic fertilizer in preparation of growing your new grass. Once this is completed we will sow in premium grass seed and top the seed off with a fresh batch of straw. This is followed up with a sprinker system which will keep the area moist by watering 2 times per day until the roots have fully taken root. Once the grass has fully sprouted we will collect our sprinkler system and over seed if needed. This may take up to 5 weeks depending on the rain and heat index during the time of planting grass.